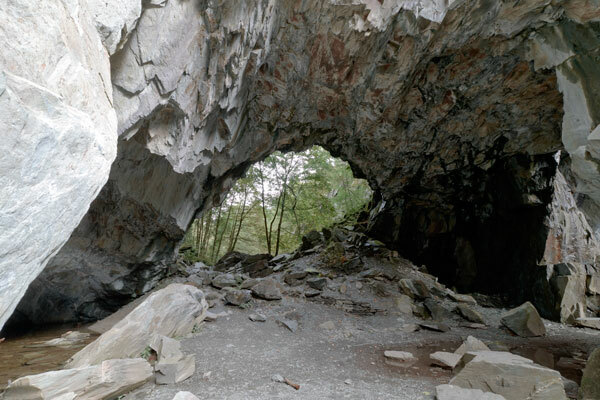 Excellent in all weathers, we visit Slater Bridge, Cathedral Quarry and the enormous hole in the ground Hodge Close Quarry on this low-level easy walk on good paths, bridleways and single track roads. It's a great adventure and kids will love it! 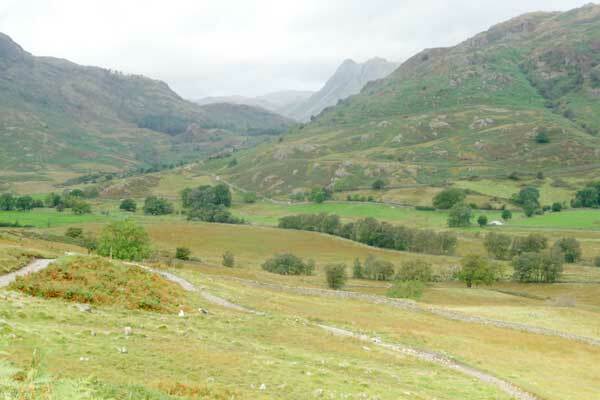 A circular walk through a blissfully delightful yet post-industrial landscape, Nature never succumbed here, the natural beauty of Little Langdale and the surrounding fells outshines the minor blemishes caused by mans search for building materials. Indeed, one could argue the slate quarry workings define the area, almost contributing to the beauty of Tilberthwaite and Little Langdale. 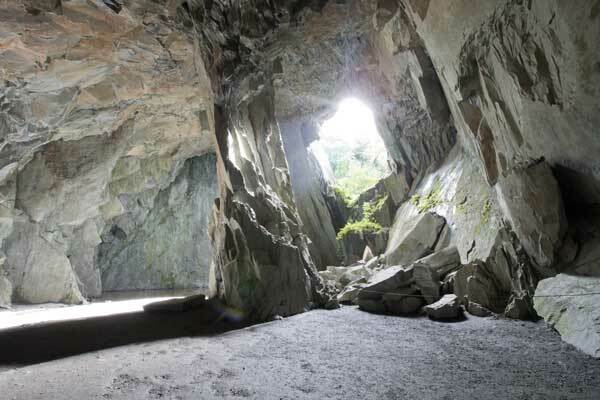 Whatever you may think, natural beauty, peace and tranquility is in abundance here in this wonderful corner of Lakeland. 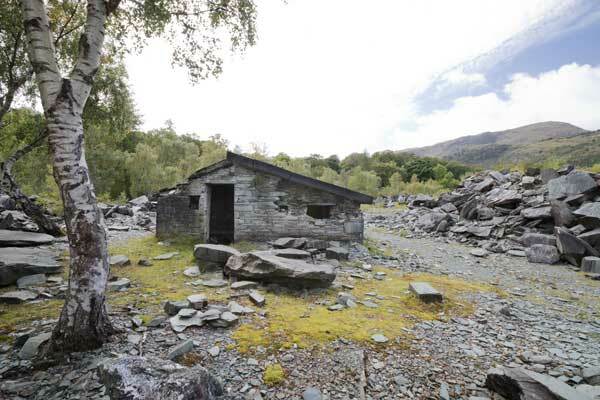 Geologically, cleaved or folded tuffs (ejected ash from a vent during volcanic eruption) of the Borrowdale Volcanic Group of Ordovician series has created the green slate found at Hodge Close. Quarrying in this area dates back to the 16th century when farmers were allowed to extract slate for building purposes but during the 18th and 19th centuries production increased massively in response to the huge demand for building materials in the growing industrial northern towns and cities. Quarrying continued here well into the 20th century. We should remember slate was won by hand up to around 1800 when gunpowder was first used. It was around 1910 when compressed air drilling was first employed and around 1930 when aerial ropeways were used at Hodge Close for transporting rock. Before then it was man, mule and muscle! Despite the significant industrial impact upon this area, it remains truly beautiful, spoil heaps of extracted material now blends into the scene as nature slowly reclaims the landscape. Today we are presented a landscape full of interest and drama, our curiosity stimulated as we wonder how life was just a couple of hundred years ago. 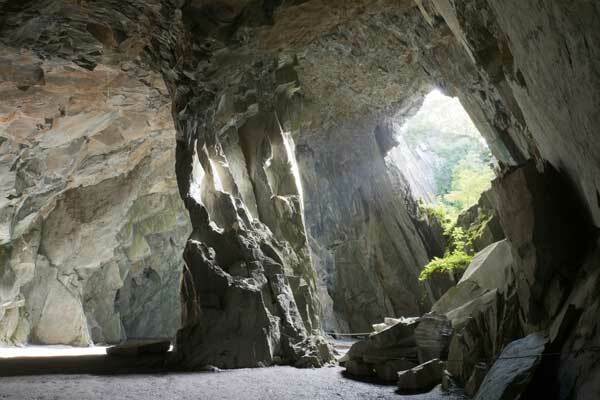 During our walk through our past, we encounter Slater Bridge, a 17th century pack-horse bridge and we visit the dramatic Cathedral and Hodge Close Quarries, all astounding and sensational – and too good to miss. 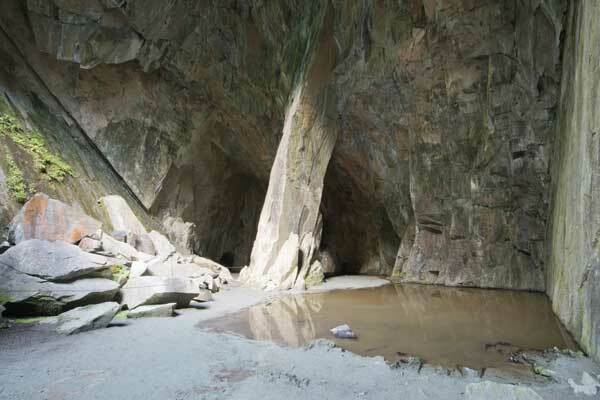 I first visited Cathedral Quarry on a school trip some fifty odd years ago, can you imagine allowing twenty kids to roam freely through the tunnels, clambering over the rocks. We had a great time! 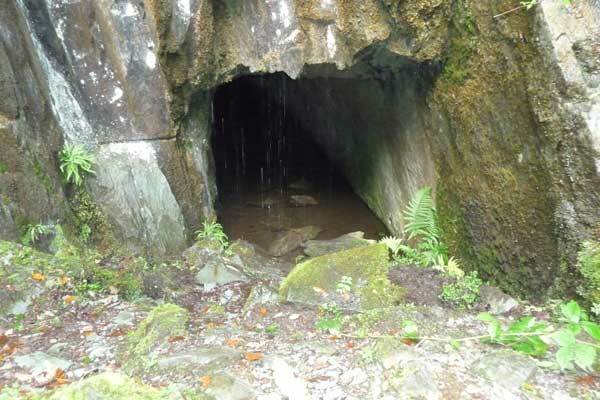 The entrance tunnel to Cathedral Quarry is obvious, it is a short easy walk into the first chamber ‘The Cathedral’ where there is a small pool by a dramatic angled rock pillar supporting the roof some forty feet above. A high window lights the chamber creating a wonderful atmosphere. A further short adit leads out of The Cathedral into a large open-air space with steep walls. A short obvious scramble up rocks leads to a balcony and viewpoint into The Cathedral. At this level, a further three adits await exploration, a torch is required. Care is required in the quarry and children should be closely supervised (unlike my school trip all those years ago). What I didn’t know back then was Beatrix Potter had purchased Cathedral Quarry, and no doubt much of the surrounding land. Beatrix Potter was a remarkable woman and indeed a wonderful role model, both then and now. Best known for her Peter Rabbit stories, she was also a capable researcher at The Royal Botanical Gardens at Kew as well as an astute discerning businesswoman with remarkable judgement, even at an early age when beginning her career as an author. There can be no doubt she was a most successful brand manager as well as successful author, today over two million Beatrix Potter books are sold each year, the merchandise probably far outweighs book sales. She went on to become a major landowner in her beloved Lake District and major donor to The National Trust, her success enabled her to leave fifteen farms and over four thousand acres of land to the Trust. I guess her devotion to The Lake District remains unequalled. Miss Potter, I salute you! 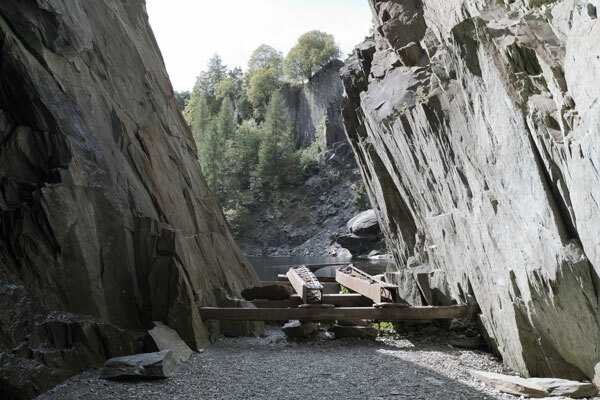 A visit into Hodge Close Quarry can be made from the walk, it’s a steep Quarryman’s path into this vast hole in the ground, the path descends steeply to reach the arch and the metal rails projecting over the flooded section of the quarry. The water used to be over 40m deep, but landslips have reduced the depth to around 30m - it's still extremely deep. A visit to the arch gives us a sense of the quarryman’s journey to work, imagine how tough and dangerous the daily routine was to produce slates and building stone. 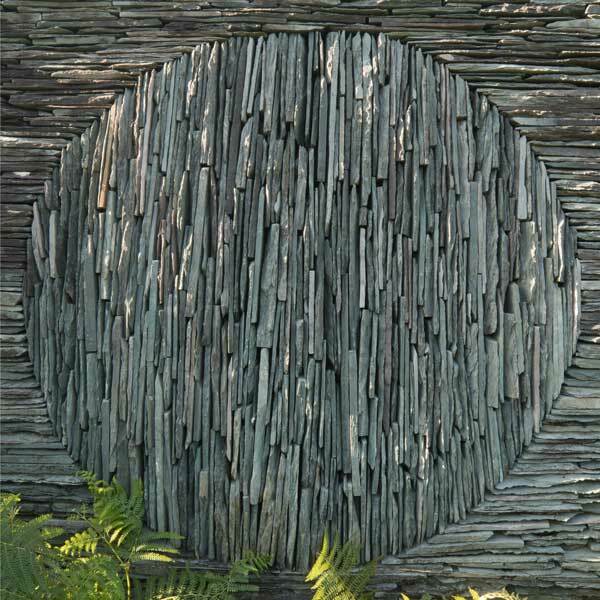 At the arch, visible are the many shades of slate, pick out the sought after Langdale green slate on offer. Our route is mainly on Public Byways, excellent tracks, paths and roads. Route finding is easy in all weathers and the low altitude makes this excursion suitable in all weathers and all seasons. 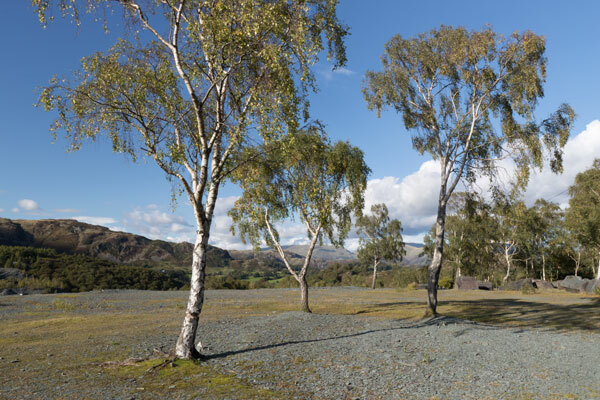 It is worth mentioning, one of the land art installations ‘Sheepfolds by Andy Goldsworthy’ is opposite the car park at Tilberthwaite and worth a visit. All on-line donations to 'Owens Walks' are handled by PayPal. NB: All of your donation will be used to support the 'Owens Walks' project. Recommended maps are OS Explorer map sheets OL6 and OL7. 1. There’s a LDNP car park at Tilberthwaite, the start of the walk. Cross Tilberthwaite Ghyll over the road bridge, continue up the road to reach High Tilberthwaite Farm. 2. 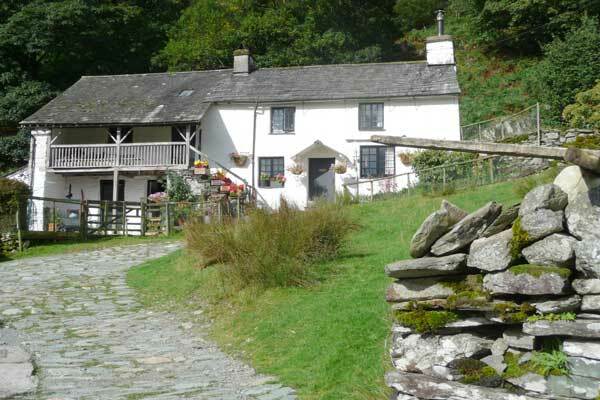 At High Tilberthwaite Farm yard, take the left hand fork, through a farm gate following the stony road uphill. Continue on the excellent byway, at the high point Lingmoor Fell dominates the view ahead, then Harrison Stickle and Pike O’Stickle appear as progress is made. Descend to a junction overlooking Little Langdale Tarn, turn right (signpost Public Way A593) passing a farm gate to reach High Hall Garth, then Low Hall Garth (climbing huts). Continue to a kissing gate and stile on the left, leading to Slater Bridge. 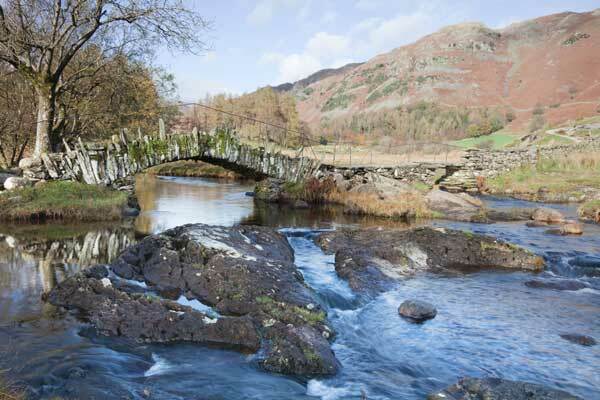 Make the short detour to the 17th century pack horse bridge – it’s worth it. 3. From Slater Bridge, return to the Public Byway, turn left to reach a farm gate. About 100m beyond the gate, follow the track on the right after crossing a fence stile by a farm gate, it’s a short uphill walk to reach a flat area where the entrance tunnel into Cathedral Quarry. See my Overtones for a brief description of Cathedral Quarry. 4. Leave Cathedral Quarry crossing the stony platform (spoil heap), descend a path to reach the Public Byway. Continue along the Byway, it’s a short distance to a footbridge beside a ford. Do not cross the river, bear right following the Byway to reach a fork (about 30m after the ford). Follow the left fork (signposted Coniston via Hodge Close), continue to Stang End. 5. Stang End is a small farm and cottages, there’s a skew in the road amongst the buildings. Leave the tarmac road by turning right, uphill signposted Hodge Close. 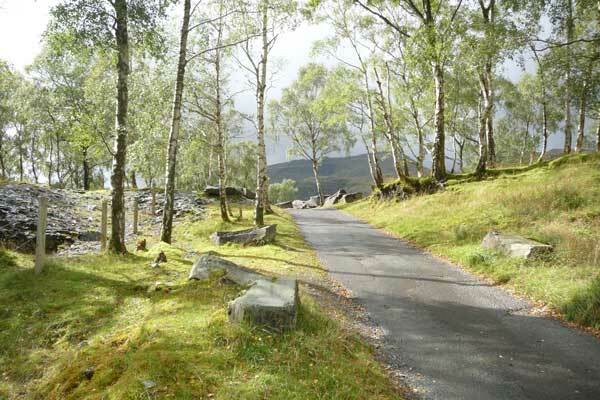 Continue along the Byway to reach a cluster of cottages at Hodge Close. At Hodge Close follow a short diversion to visit Hodge Close Quarry, there is a bridleway on the left, walk up the bridleway for 20m, follow an indistinct path on the right, descend the steep path into the Hodge Close Quarry to reach the arch, return to the road. 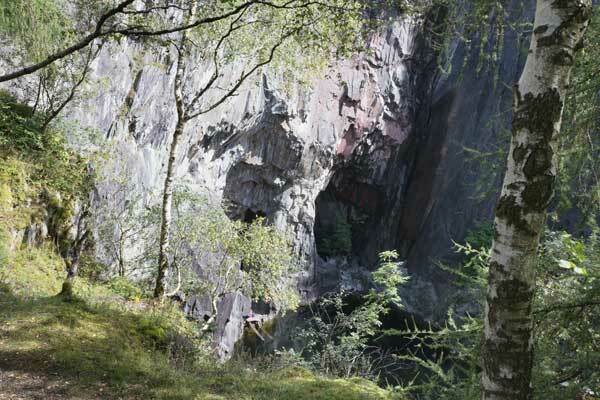 Continue uphill, the impressive Hodge Close Quarry is on the left, walk along the road to the far end of the quarry. 6. At the south end of Hodge Close Quarry, leave the road on a bridleway on the left through woodland, the bridleway runs almost parallel to the single track road. Continue on the bridleway, passing the back of a row of cottages then a farm. Continue along the bridleway to reach the road. Turn right on the road, walk up the road for about 500m to reach a public footpath (signposted) on the left. 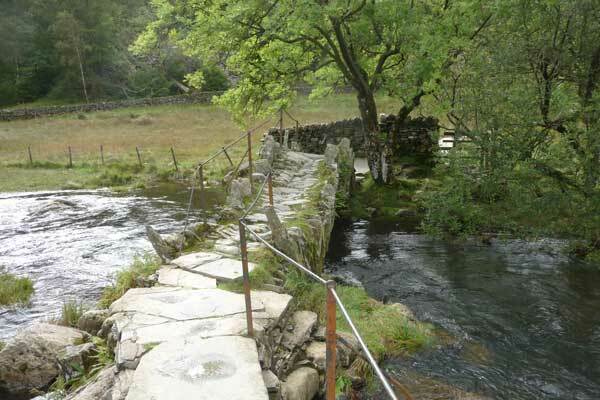 Leave the road, follow the path into woodland, cross two fields to reach High Tilberthwaite Farm. Return to the car park along the road. Go to the downloads section to download this route description.